Yamagata Film Critic Workshop Day 3 : Storm Children Book One (Jay) – ドキュ山LIVE! 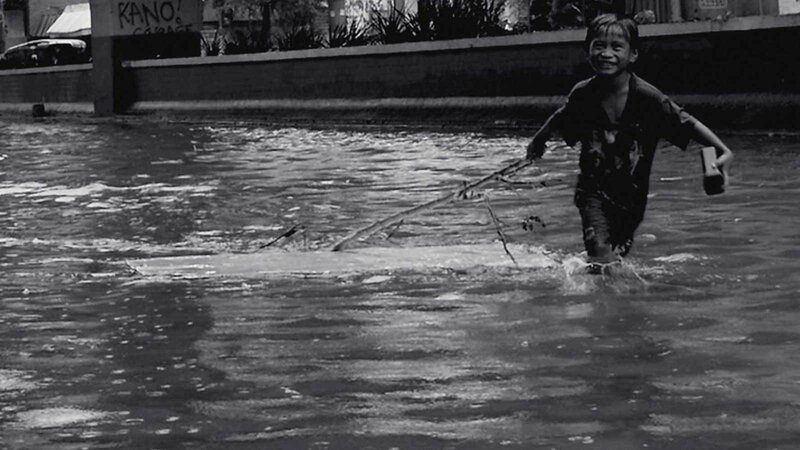 The above excerpts are taken from a 2013 interview with Lav Diaz in CinemaScope magazine, where he was asked about the “ubiquity” of storms in the Philippines. After watching his Storm Children: Book One, as part of the 2015 Yamagata International Documentary Film Festival’s Film Criticism Collective Program, this quote instantly came to mind. Diaz’s estimation of this Filipino reality carries a great philosophical weight for the understanding of our psyche – why despite being battered by 20 storms a year, hope still springs eternal. This affinity to the subject matter is perhaps what prompted him to head straight into the most ravaged city of Tacloban three months after Typhoon Haiyan left its destructive path in December 2013. Haiyan, considered to be the strongest typhoon in history, almost defaced an entire city and destroyed livelihood and lives. The tragedy is enormous and the impact on the people who lived to tell the horrors of that onslaught is unspeakable. But in Diaz’s documentary, a perfect example of Direct Cinema, the tragedy and poverty that arose from the destruction are never mined to elicit charity or pity. The straightforwardness of the approach is deliberate (the credits would show you that the film is “recorded by”), capturing long static shots of floodwater, debris and the children who frolic and rummage through them, with little editing, letting us soak through images and getting a feel of the place. This approach is in fact trademark Diaz, employing the same style of black and white photography and slow, deliberate pace, which is featured in his better known narrative works. But the documentation changes pace in the second half. The static shots and long takes are now interspersed with handheld ones. Where in the first half the camera records the events at a distance, Diaz slowly inches closer to his subjects – the children who scavenge this seemingly post-apocalyptic milieu. He briefly allows one character – a boy we see tirelessly fetching water for his family – to have a voice. The boy laments how his older brother gets to complain about him resting while the older brother does not even have the ability to find a job. It is a powerful scene, one that shows Diaz’s understanding of the humanity that still persists amidst the tragedy. It is also one of the scenes where Diaz clearly puts faith in the resiliency of the Filipinos’ spirit: the children seen here embody the courage to soldier on (there is even one scene where a group of young girls sing “Let it Go” from Frozen, a stark contrast to their reality). He also spends considerable time filming two boys digging in a mound of debris. This is Diaz giving us a sense of his own search for meaning – the images reflecting the uncertainty of the first half of the film. He briefly interviews one boy under a ship washed ashore, then follows him to see where his house is. We learn from this brief section how a ship – a towering, uncomfortable visual presence in the film – wrecked a stretch of houses in a single swoop. Diaz shot Storm Children at the same time he was editing his Locarno-winning Mula sa Kung Ano ang Noon (From What Is Before). And while From What Is Before is set in pre-Martial Law Philippines, both films portray a society that grapples with the reality and brutality of change, whether political or natural. The soundtrack of rushing water, especially in the first half, also recalls the diegetic use of the terrifying waves in From What Is Before. 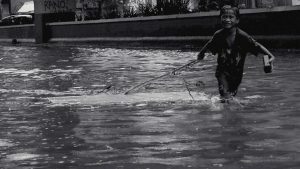 Water in both films serves as a physical force that the characters find themselves having to struggle with – whether it is rushing or roiling, it is an ever-present reality like the reality of the typhoon in Philippine culture.